Lt Gen (ret.) Leandro De Vincenti served as Commander of the NATO 5th Combined Air Operations Centre, Poggio Renatico, ITA. During ­Operation Unified Protector, he served as Chief of Staff, Joint Force ­Command, Naples. In addition to accruing many years of ­flying experience in the Typhoon and AV-8B, EH-101 and NH-90, he has also served as the Chief of Staff, NATO HQ Naples and has ­commanded the 9th Wing of Grazzanise in addition to multiple staff tours in various Headquarters. Despite there being no clear and/or approved definition of the term ‘Degraded Environment’ in any military glossary, there is nevertheless a strong – albeit rarely voiced – awareness of the potentially negative impact and disruptive effects that such a ‘condition’ may have on Joint Air Operations by almost every Political/Military leader. Even though the term ‘Degraded Environment’ is largely undefined, the general understanding of the potential ‘Threat’ posed by it is conceptually absolutely clear, in that the ability to continue Air Operations as planned is compromised, thus potentially jeopardising the accomplishment of the entire mission. Degraded environment threats are undefined and there are a variety of reasons why they may arise in the operational arena, from those caused by enemy actions to those caused by natural factors and which can impact in all operational fields. What is clear is that, despite being undefined, un­predictable and in some way unknown, a ‘Degraded Environment’ always represents a threat that will undoubtedly impact and affect military oper­ations across the entire spectrum of warfare. 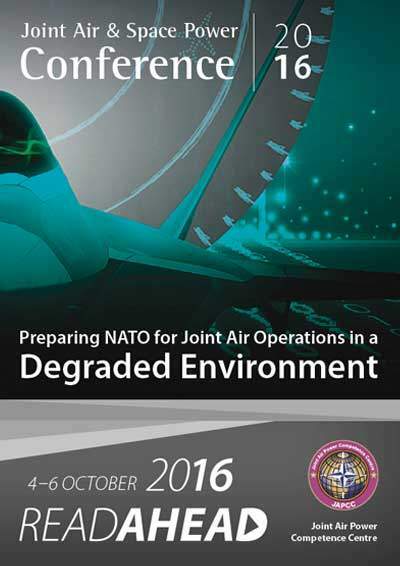 Therefore, ‘How to prepare NATO for Joint Air Operations in a Degraded Environment’ is complex and there are no easy and unique answers. This paper offers some possible considerations from where to start the discussion of where and how to prepare the NATO Command and Force Structure for such operations. Recent contemporary operational experiences (Afghanistan, Libya, Iraq, Syria…) have already forced NATO to move away from its ‘classical’ ­approach to Operations and have driven the redevelopment of Tactics and Doctrines. New ‘types’ of combatants have entered into a ­completely ‘new’ and ‘chaotic’ operational environment where opponents feel free to follow unusual and unexpected ‘lines of operation’. This can disrupt previously consolidated tactics, procedures, rules, protocols and international ‘conventions’ and can limit and condition freedom of action and manoeuvre for ‘official governments’ within a coalition. This trend will likely continue to accelerate, driving a need for new Doctrines as a result of the large variety of possible means of degradation in oper­ational ­scenarios. The unavailability of a Satellite network would, of course, have a negative impact on many individual capability areas such as Strat Com, C2, Civil Military interaction, Space domain, but, if coupled with a degradation of the Electro-Magnetic spectrum and in the Cyber domain, the resulting dramatic reduction in environmental quality seems very likely to be cap­able of causing the collapse of all previous classical ‘assumptions’ about the use of Air Power and related weapons. So, how to approach the ‘preparedness’ of NATO? To consider and study, individually, the very long list of possible areas ­likely impacted by a Degraded Environment situation, whether caused by specific enemy action and/or by any other natural environmental factors, would be a ‘mission impossible’! Rather, it may be better to consider a different way of ‘how’ to approach the Planning Process of the Operation from the very beginning, reintroducing additional and incremental ­planning factors similar to those in use before the advent of modern Information Technology. This might be considered as some sort of a ‘back to the future’ game. In aiming to ‘mitigate’ rather than to ‘solve’ the wide range of possible negative impacts, a first tentative option might be to pre-plan an ­equally vast range of preliminary measures when starting the mission planning process. In fact, the availability of a more robust and more comprehensive Rules of Engagement Catalogue, taking into consideration a wider range of ­different options related to different levels of environmental degradation, may set the conditions for a preliminary acceptance of possible higher risk of friendly losses and civilian casualties because of precision and accuracy reductions in a degraded environment. This might prevent, or at least ­limit, the subsequent effect on StratCom messaging and the natural ­political aversion in this regard. Such Rules of Engagement should be proposed by Operational Commanders and approved by political Authority after much deep legal assessment. Redundancy in pre-planning and prioritization of backup plans as part of the operational planning process may also help mitigate unexpected situations which arise in a Degraded Environment, especially if ­combined with a significant reconsideration of the balance between deliberate and dynamic targeting. In fact, while the first (deliberate targeting) ­involves the generation of an extensive detailed Target Folder, possibly prepared well in advance and when still in an unconditioned and ­uncontested EMS/EW and Communications environment, the second (dynamic targeting) strongly demands significant last minute ISR&COMM capability because of the lack of a detailed Target Folder of ‘unpredicted’ new targets. Additionally, a different approach to the formation of the Joint Prioritized Target List (JPTL), including a different and wider list of Targets combined with different types of Weapons to generate a sequence of ‘graduated’ backup JPTLs, would offer an additional possibility to select a set of TGTs and ­related Weapons according to the different levels/types of degradation. ­Doing this would help sustain the Air Operation, even if with some limitations. For example, shortening the C2 chain and relying on different standing ­orders may be an additional technique to maintain the basic principle of Air Power, which strongly demands Centralized Control-Decentralized ­Execution. Prioritized action and alternative courses of action, developed well in ­advance, may also provide effective mitigation to some degradations. What we can assume is mandatory is the investment of additional effort and the formation of a new mindset in approaching and performing the Operational Planning process; this must take into consideration the many possible different options which arise from scaled levels of Environmental Degradation. Nevertheless, none of the above mentioned mitigation measures will alone represent the solution. A combination of all the above mentioned proposals could represent a starting point to approach the way to prepare NATO for thinking about a new Doctrine on how to prevent the potential constraining of Air Operations in a Degraded Environment.